These days, my jungle adventures seem limited to watching Survivor and occasionally ambling through a local nursery. It’s just not the same. 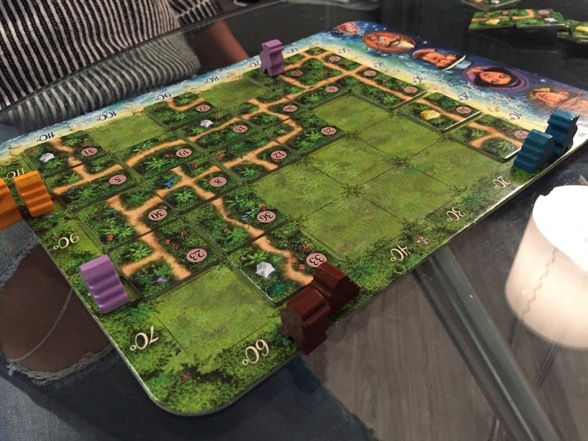 Luckily, there’s a new game out called Karuba that yearns to scratch that jungle itch. Does it? No, of course not. How could an adorable game compare to Michael Douglas, Danny DeVito, and Kathleen Turner? 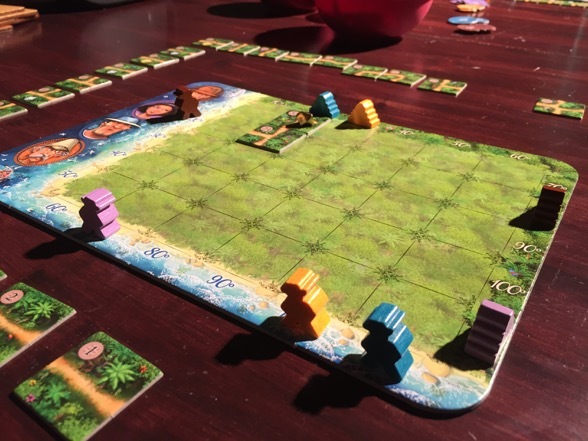 But the good news is that Karuba is super fun, and there’s no threat of death by crocodile.Designed by Rüdiger Dorn, Karuba is a family game with simple rules and a neat Bingo-esque mechanic. Beneath its kid-friendly façade, however, is a clever puzzle that can stimulate, challenge, and stymie people of all ages. 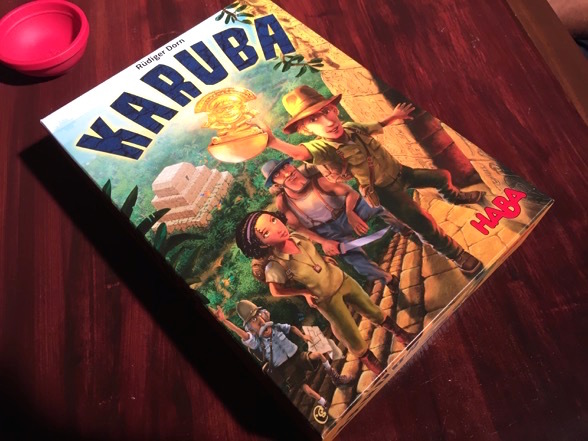 Yes, Karuba is a sneaky little game, and as such, it has gathered increasing buzz since its release in 2015. 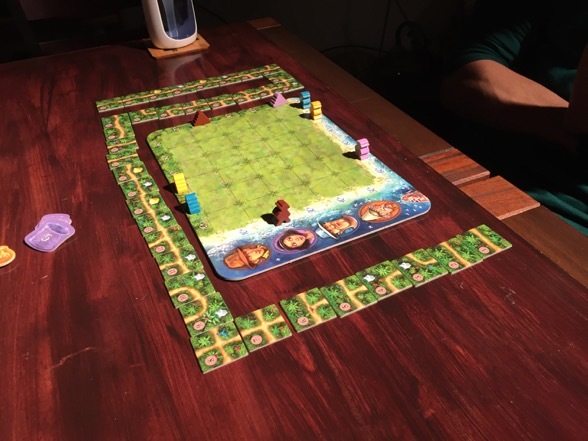 This recently culminated with a nomination for the Spiels de Jahres, which is sort of like the Oscar for Best Picture in the board game world. Here’s how this madness works. Up to four players receive one of these boards. 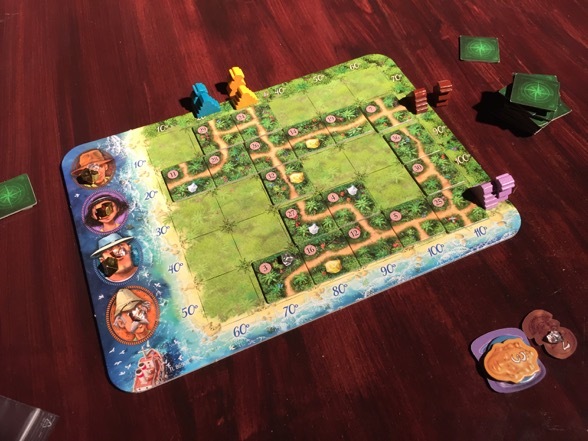 It depicts a jungle coastline as well as four intrepid explorers. Pausing to recreate Jurassic Park. 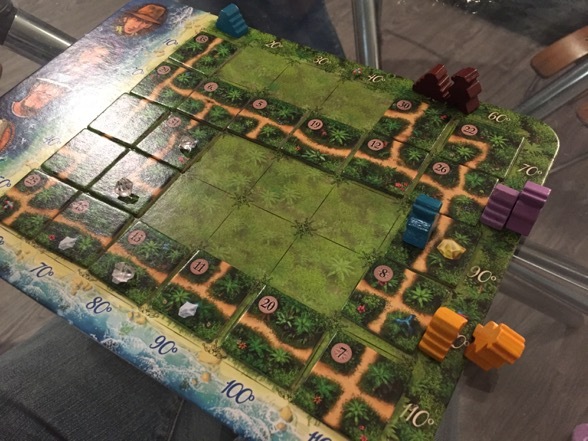 Next, players place temples along the “jungle” edges of the board. Every player board must match. And yes, the brown temple does look like the poop emoji. In an effort to be more mature, I prefer to call it the Chocolate Temple; although, that seems to elicit even more snickering. We then place explorers on the beach. Again, all boards must be identical. Every player has an identical stack of jungle tiles, numbered 1-36. Except for one person, we lay them out in order around our boards. The goal of the game is to place the jungle tiles to create a path that the explorers can use to reach their temples. For instance, the blue explorer needs to get to the blue temple, the yellow to the yellow temple. As you can see from this setup though, there’ll be plenty of criss-crossing along the way. 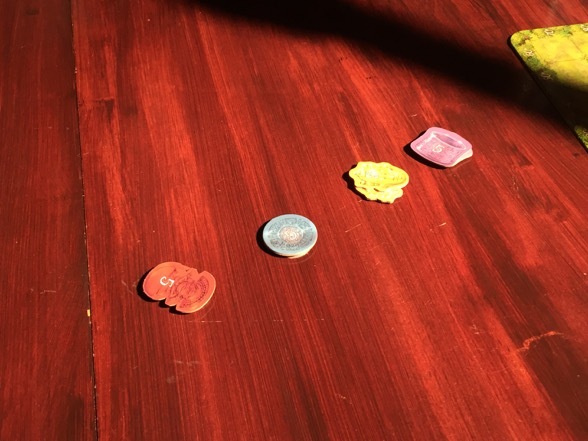 Each person to reach a temple gets to grab one of these color-coded bonus point tokens. The first one is worth five, then four, then three, etc. etc. The point is, you want to get to a temple before anyone else. 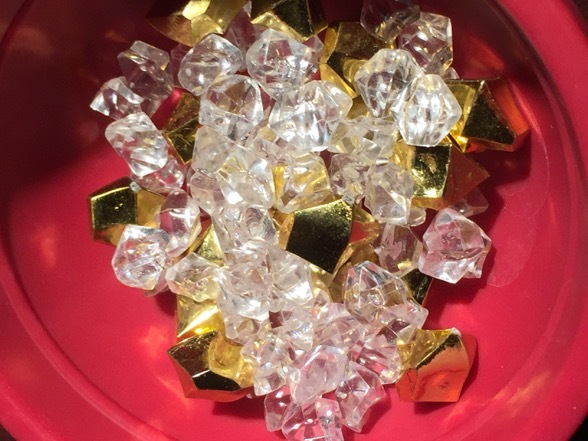 Some tiles, when placed, get a diamond or a piece of gold put on them. 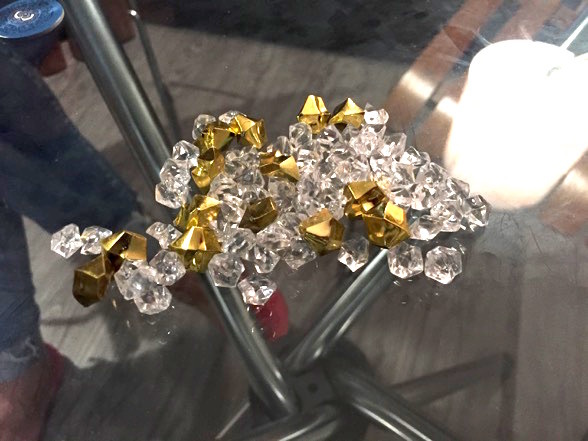 If explorers pick up these valuable jewels, they’ll earn more points (and certainly bragging rights on The Real Housewives of Karuba). After two turns, my board looks like this. 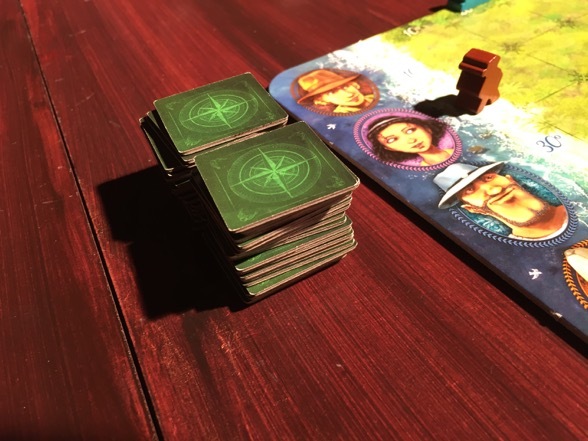 My friend James has similarly decided to place a t-path next to the yellow temple, but he’s positioned tile 32 much closer to his blue explorer. Meanwhile, Brendon has doubled-down on a blue temple strategy with the tiles. 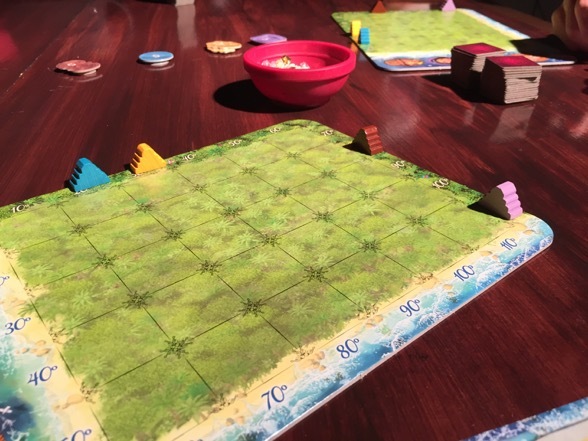 Despite starting with identical boards and tiles, by two turns in, we all have very different layouts, which will lead to wildly different outcomes. It should be noted that instead of placing a tile, players can opt to discard it, which allows them to move exactly one explorer the number of spaces as there are “exits” on the tile. So, for instance, a tile that is just a horizontal line has two “exits” whereas a cross has four. This is what drives the movement in the game, and it’s also where the strategy and timing come into play. This isn’t merely an exercise in making neat trails. It’s a balancing act between movement and planning. 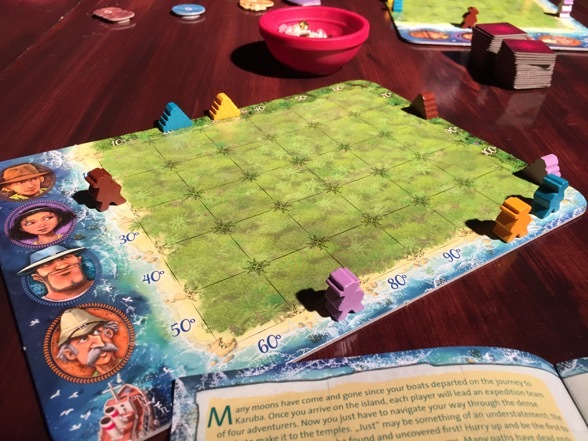 The aforementioned “cross” tile is extremely versatile and therefore powerful when forging a path… but it also allows explorers to move the farther distance in one turn. Speed vs. design is a constant struggle, and knowing when to send your people forward into the thicket is one of the most critical decisions in the game. Making this process even trickier is that explorers cannot leapfrog each other, and therefore, they are constantly getting into each other’s ways. 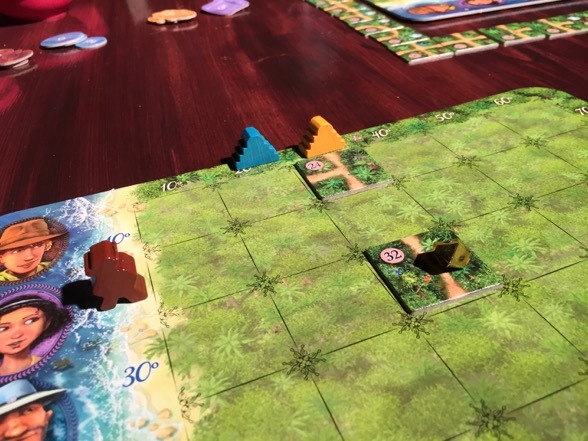 To avoid these jungle traffic jams, players must either send their explorers down the path in staggered intervals or merely construct alternate routes. It all depends on what tiles become available. I’ve certainly found myself stalling round after round, waiting for the perfect tile to be drawn, only to watch other players happily strut their explorers into their temples. On the flip side, I’ve also definitely been the one to see my perfect plan come right into place, allowing me to create a veritable superhighway in the wilderness. The point is that this game produces plenty of emotional peaks and valleys — just like a great jungle adventure of yore. And the best part? After twenty minutes, it’s over. If you’re feeling demoralized by your horrific paths that lead to nowhere, fear not: in no time you’re wiping the slate clean and starting anew. It’s downright impossible to play just one round of this game and then move on. 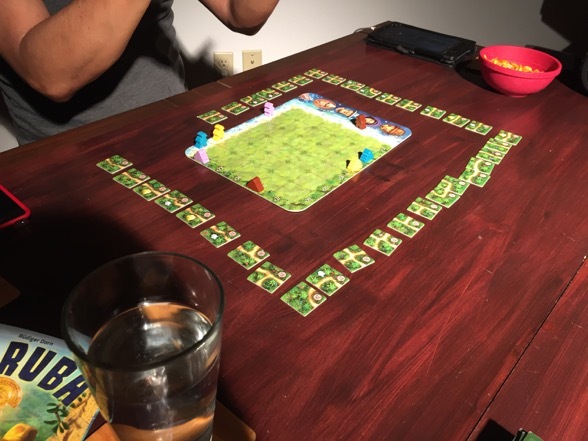 You’ll be play two, three, or four rounds in a row, and all the while, you’ll be chuckling as you and your friends lament your strategy, cheer for tiles, and curse an unexpected logistical disaster. Additionally, those jewels on the path add quite the game-changing opportunity. 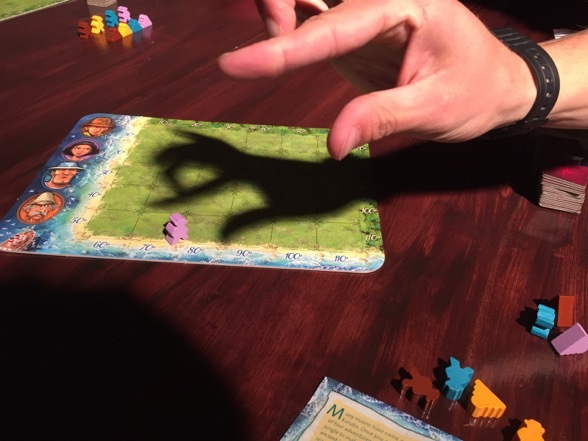 Players who ignore them may find themselves eclipsed by an intrepid collector during the final point tally, especially since final scores are often just a point or two apart. But those who spend too much time gathering diamonds and gold may be too late to the temple party. It’s all about keeping an eye on everyone else’s board and making sure you’re not falling too far behind the diamond, gold, or temple race. 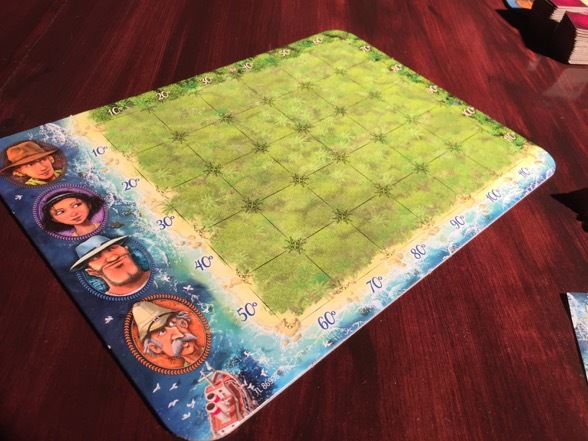 This introduces a nice amount of subtle player interaction, which is particularly welcomed in what would otherwise be a rather solitary affair (staring at your board, placing tiles). My victorious board. I managed to reach all four temples, which causes the game to end (alternatively, the game also ends once all thirty-six tiles have been played). James had some hiccups with his board. Note the yellow explorer who never even had a path to start with. He was just chilling on the beach, enjoying the sun. Brendon’s jungle map is very strong. He finishes one move behind me. A few days later, I play the game with my lady friend Sly. It is an instant hit with her. 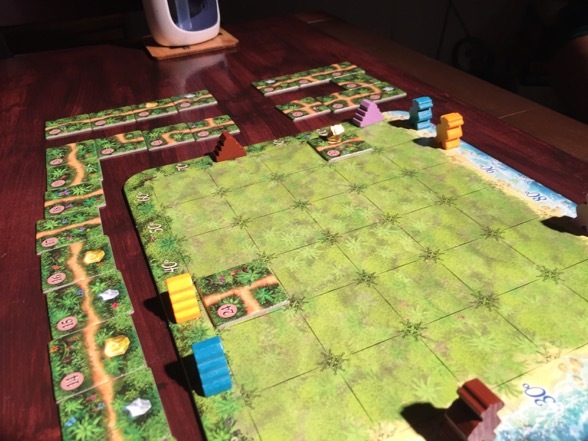 The good news is that Karuba plays just as well with two people as it does with three or four. Despite never having moved the lilac explorer off the beach, Sly still manages to destroy me with her temple-reaching prowess. 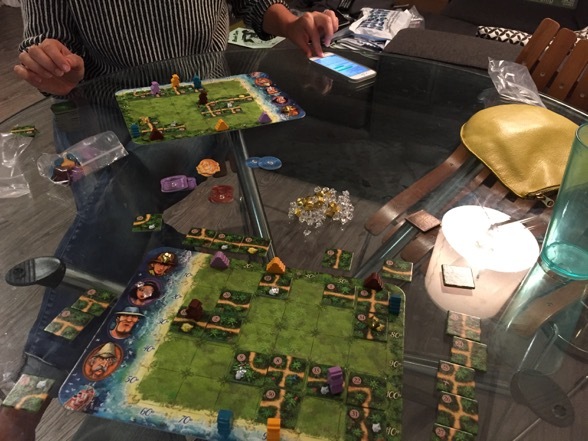 Thanks to HABA Games for providing a review copy! For more information on the game, check out the official site for the game here. 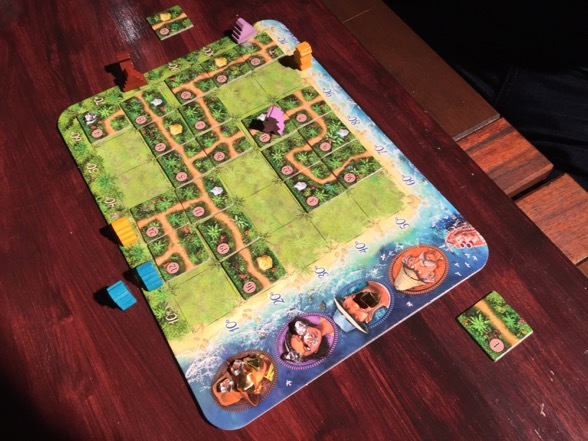 This entry was posted in Games and tagged Adventures in Game Time, board games, boardgames, Karuba, Sly by Ben Mandelker. Bookmark the permalink. Looks fun! 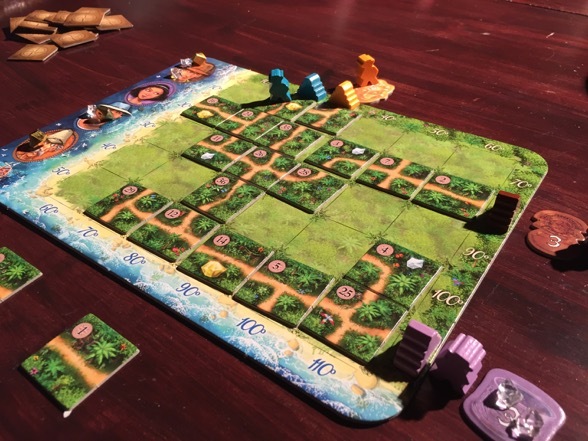 Although I’m sure I’d only get to play it once as my friends will refuse to ever play again knowing I won’t stop singing “Karuba, Jamaica, oooh I wanna take ya…!” the entire time.